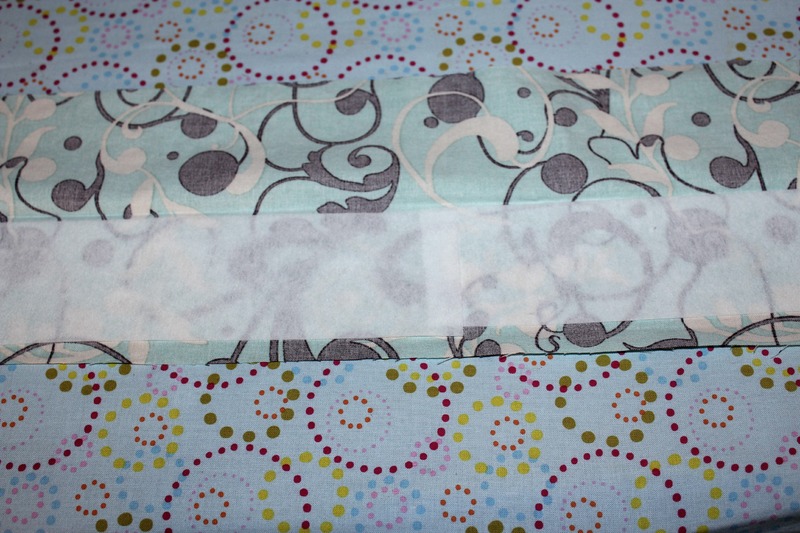 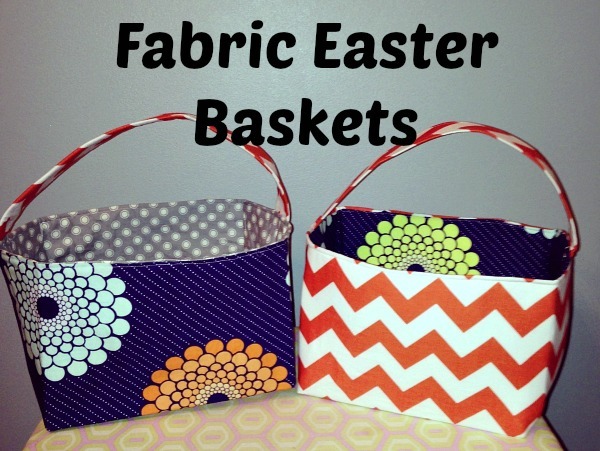 There are projects all over Pintrest on how to make cute reusable paper towels with flannel and terry cloth. 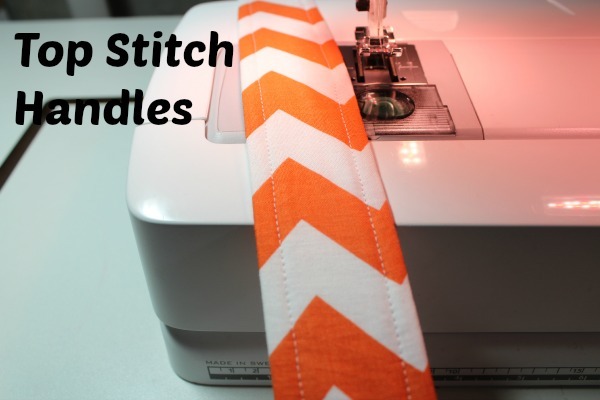 Which I think are really cute, but they just take to much time to make in my opinion, from sewing them together to putting on snaps or velcro . 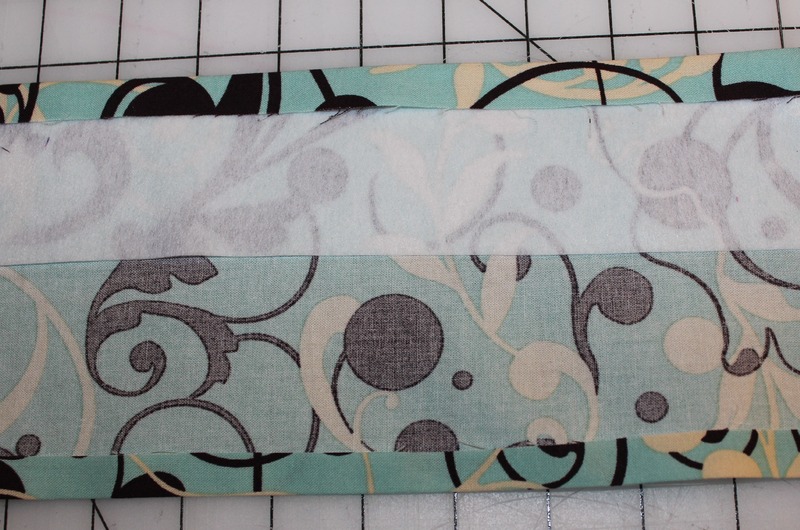 I don’t want to waste a lot of time on something that is going to be stained the first time I use it, or maybe your kids don’t spill stuff like mine do? 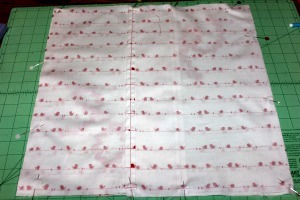 Grape juice anyone. 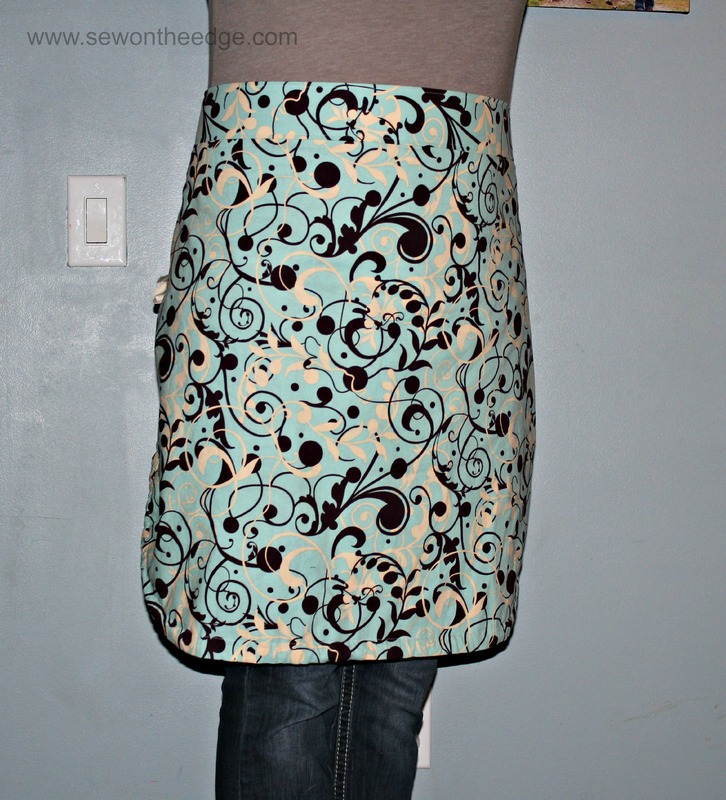 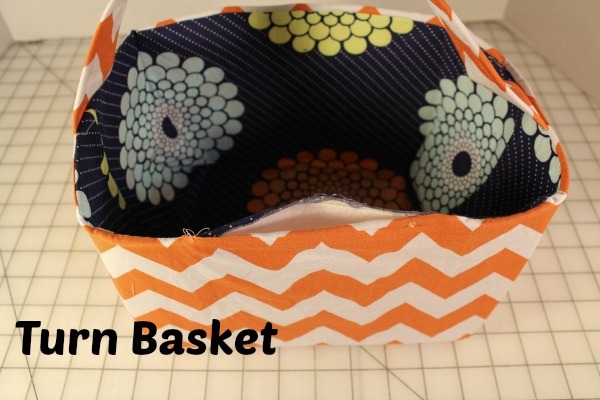 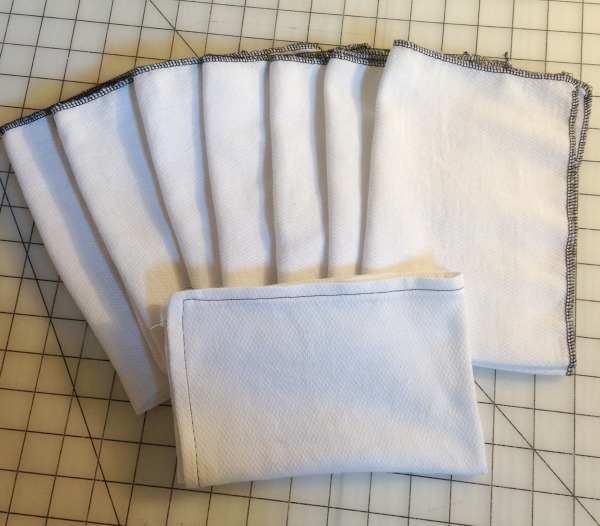 So here is a quick tutorial on how to make un-paper towels with birdseye cotton using both a regular sewing machine and a serger. 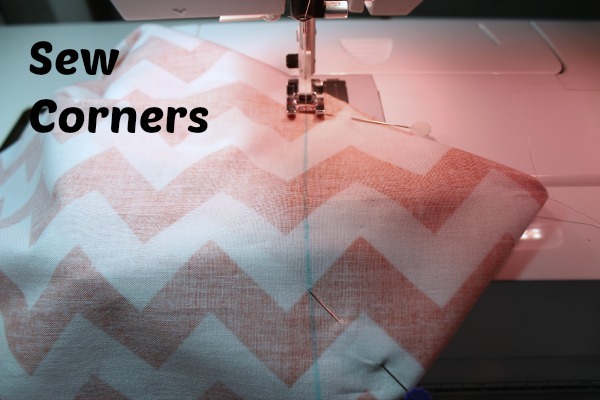 We have been using these towels for about a year now and we love them. 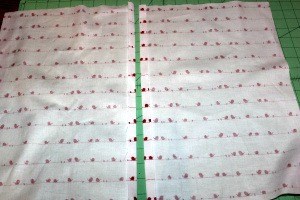 The best thing is that they are white so you can bleach them when they get to gross looking. 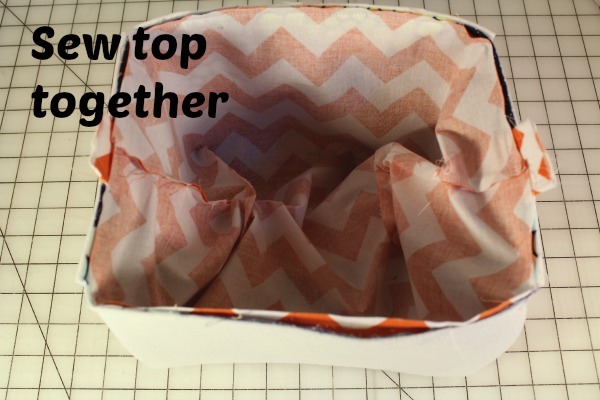 Step 1: Wash your fabric. 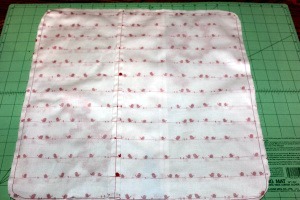 Birdseye will shrink so it is important to pre-wash and dry your fabric before you start. 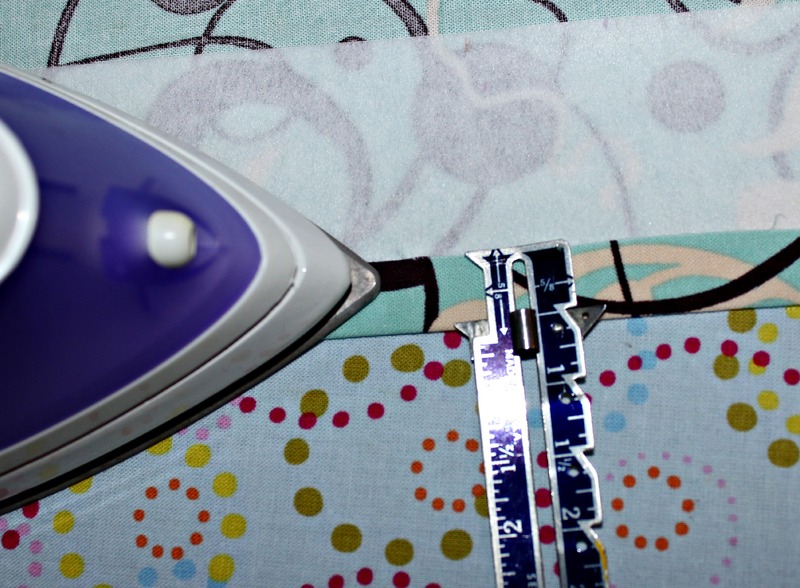 For 6 towels you need to plan on 1 1/4 yards of fabric if you are serging and 1 1/3 yards if you are using a regular sewing machine. 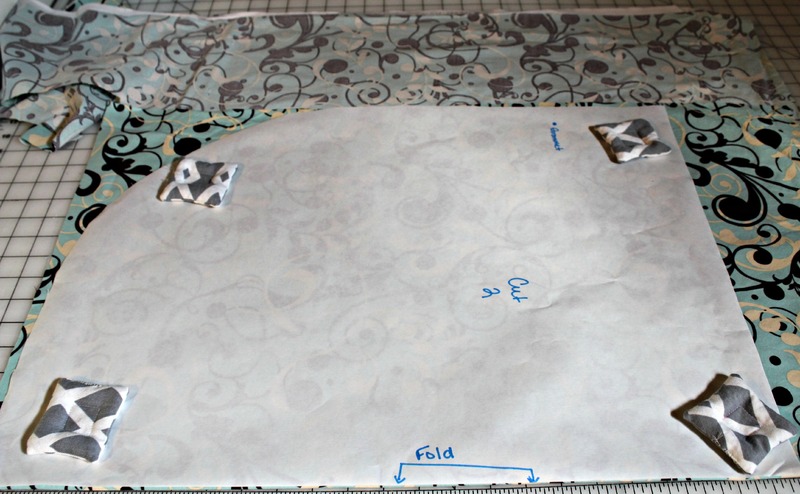 Step 2: Cut your fabric, you can use whatever measurements you want, but for these I used a 12″x 18″ for serging if I was hemming them I would cut it 14″x18″ . 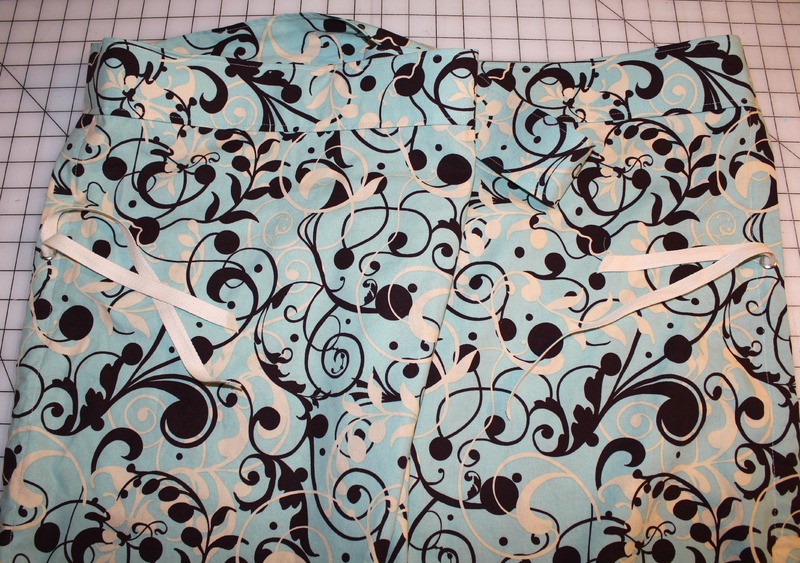 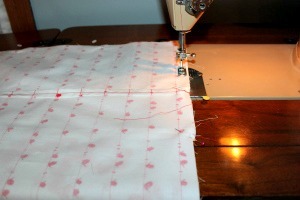 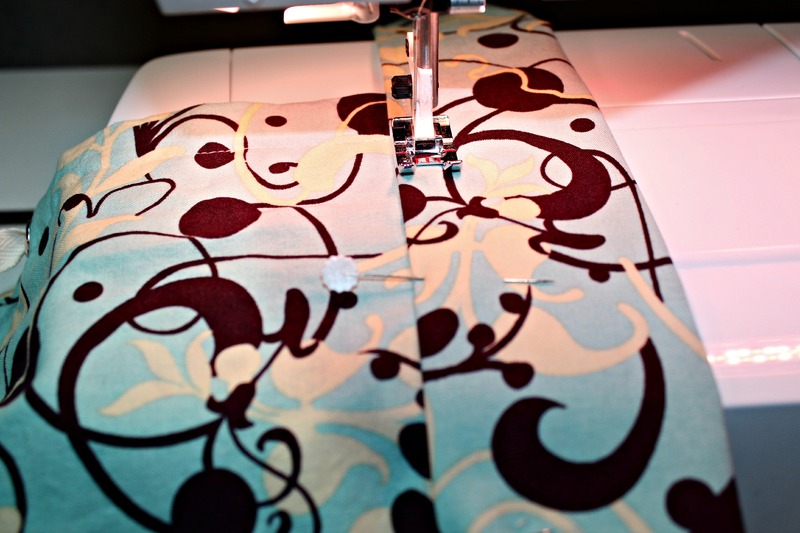 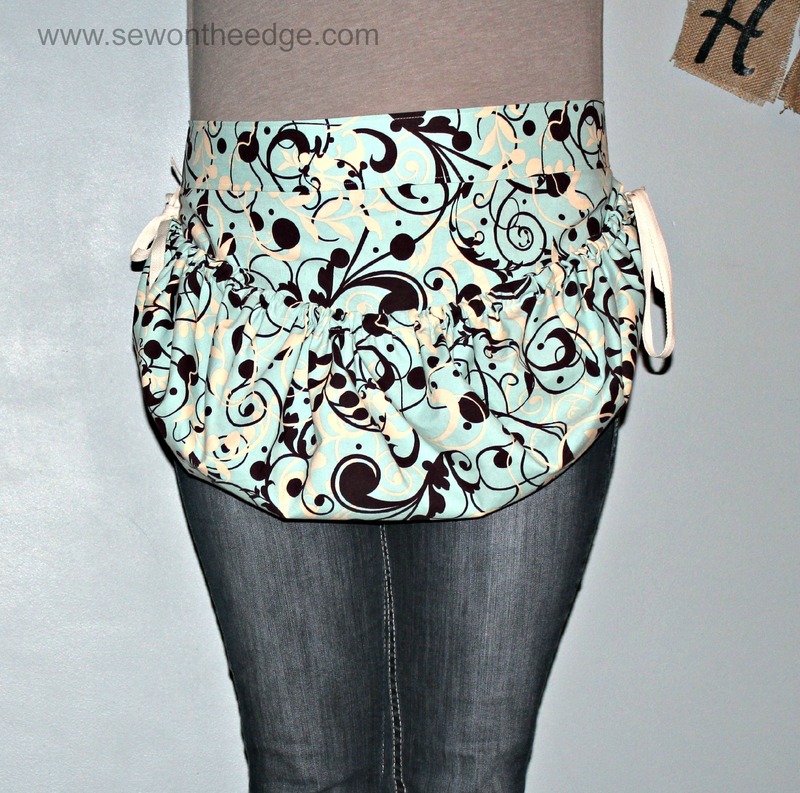 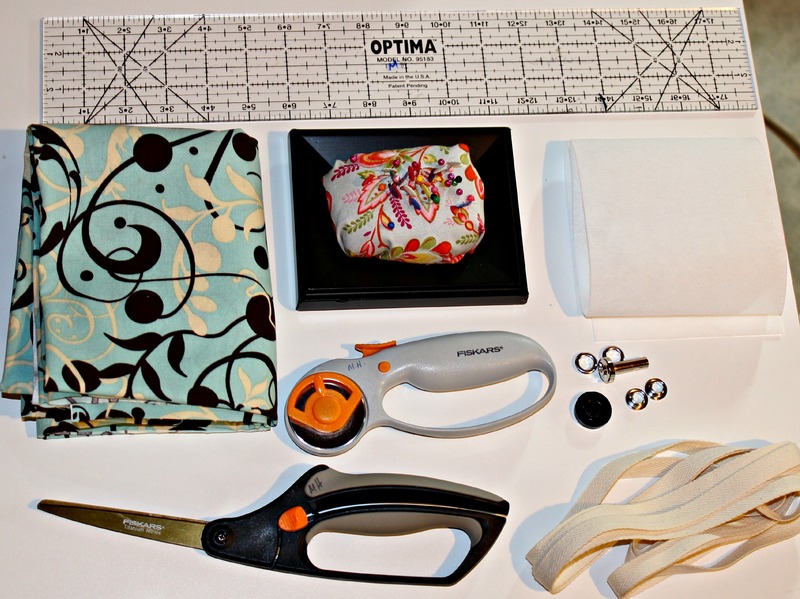 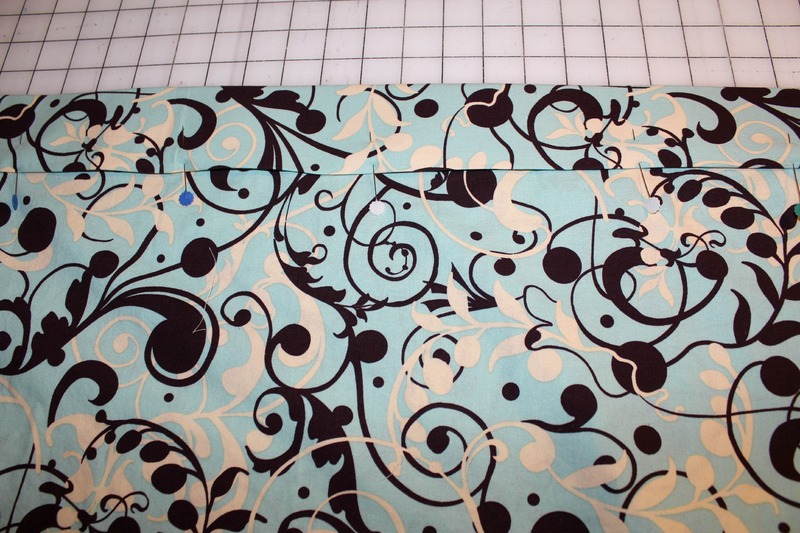 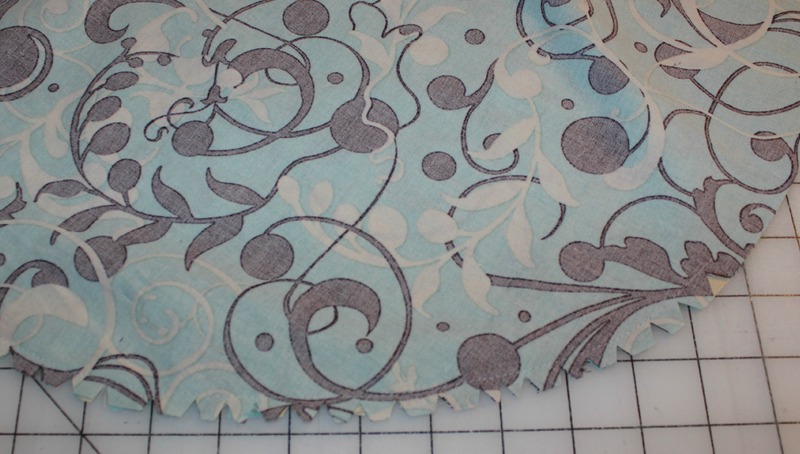 If you are using a serger you can skip down to Step 5. 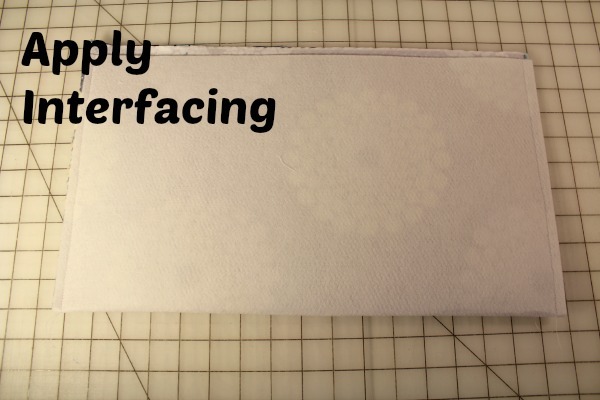 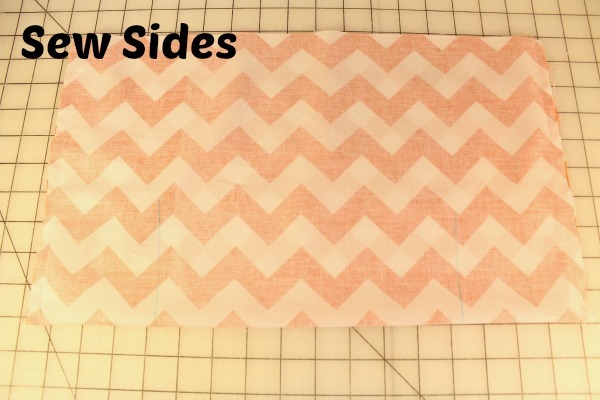 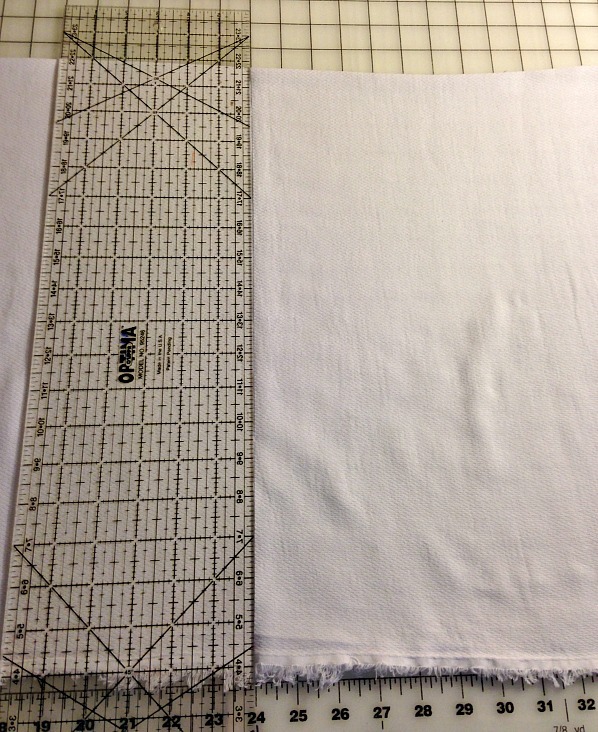 Step 3: If you are using a sewing machine you will want to fold and press your edges down 1/2 inch and then turn them over another 1/2 inch and press to make sure the raw edges are folded under. 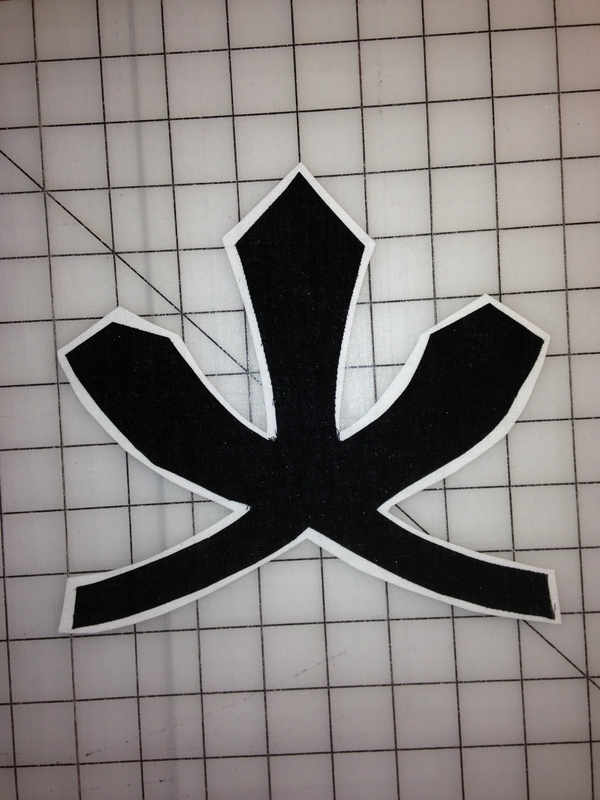 Pin if you need. 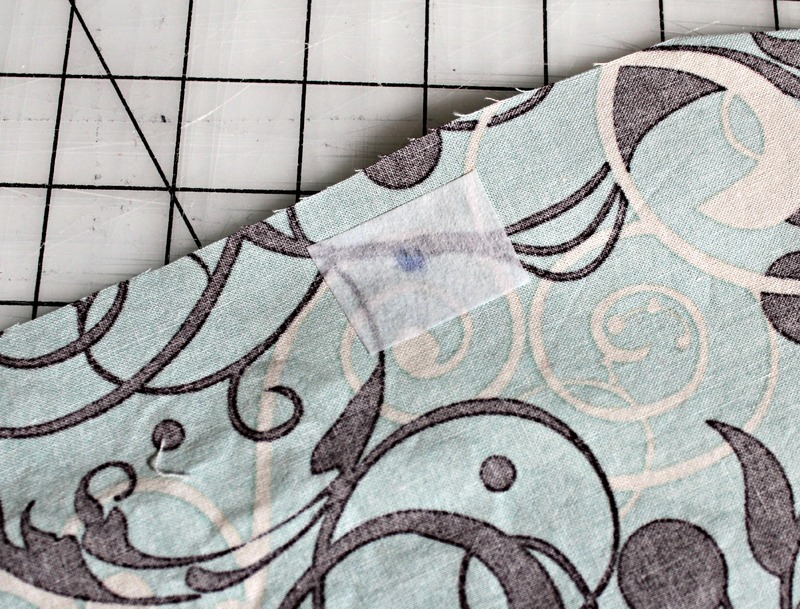 Step 4: Sew around the edges. 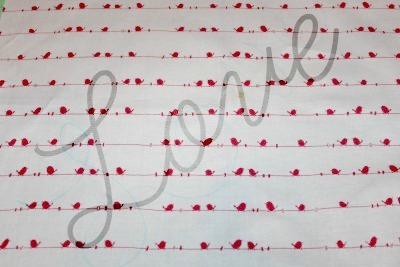 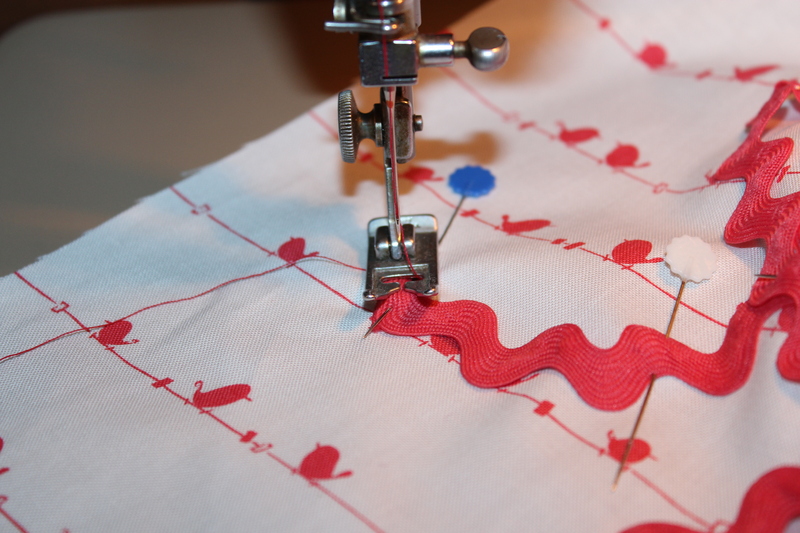 Don’t forget to back stitch at the beginning and end. 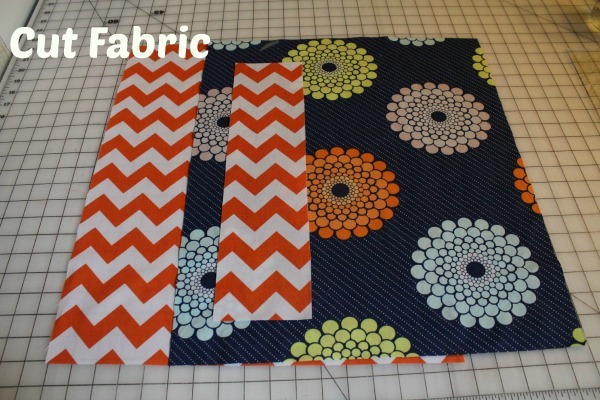 I used a 3/8 seam. 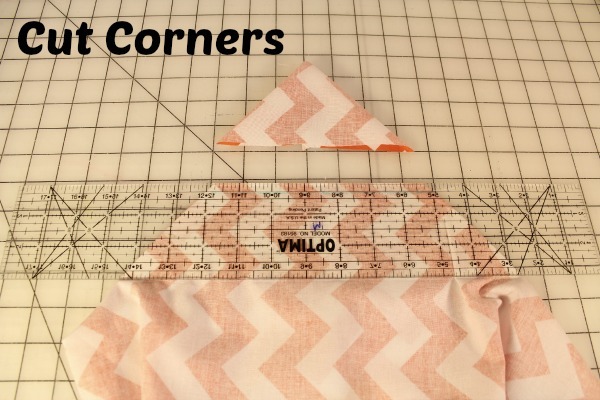 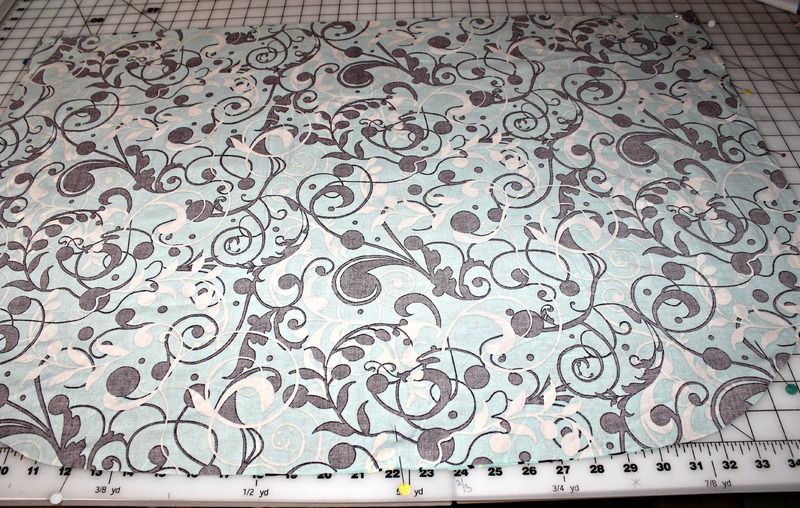 Step 5: If you are serging, you can cut curves on the corners to make it easier to serge. 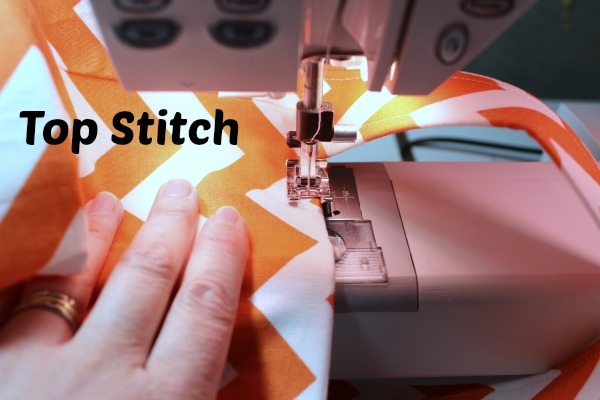 Lock your stitch in place. 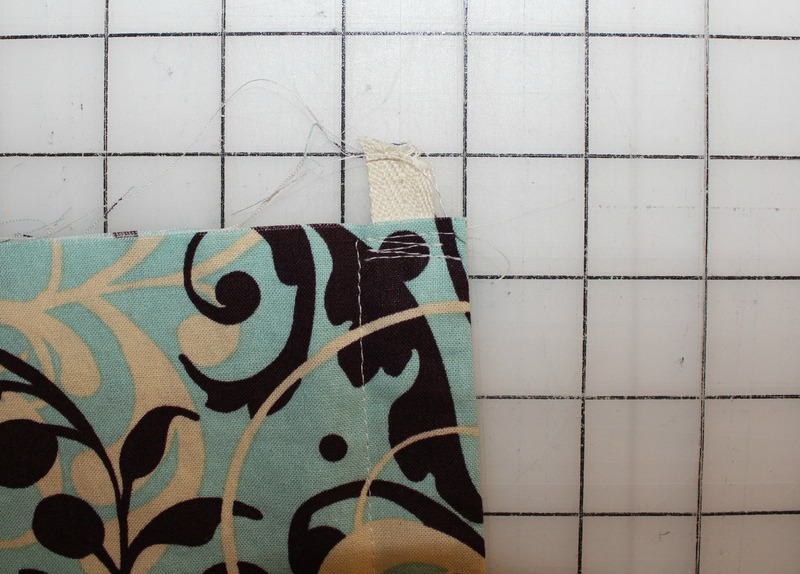 I like to use fray check at this point to lock my stitches. 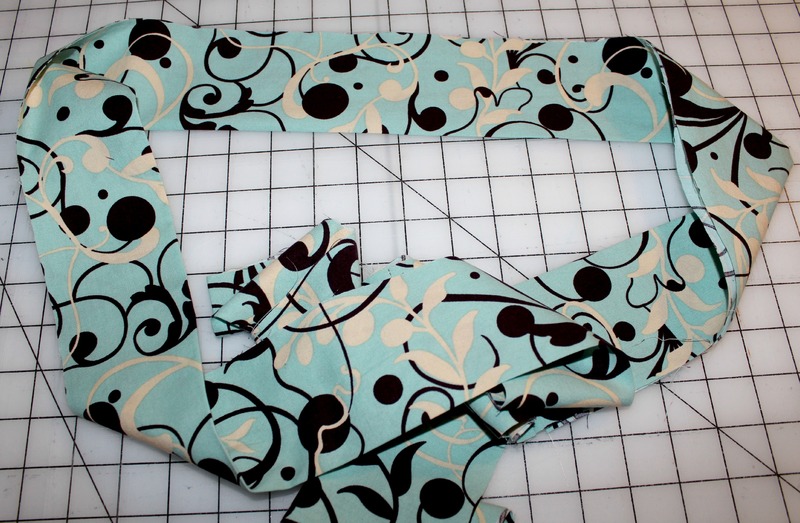 Step 6: You are finished. 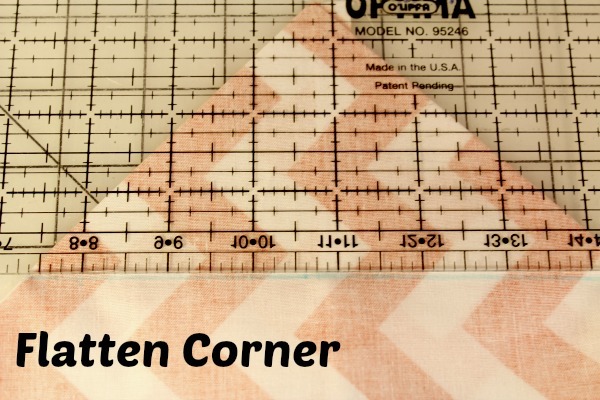 Now take them into your kitchen and start using them. 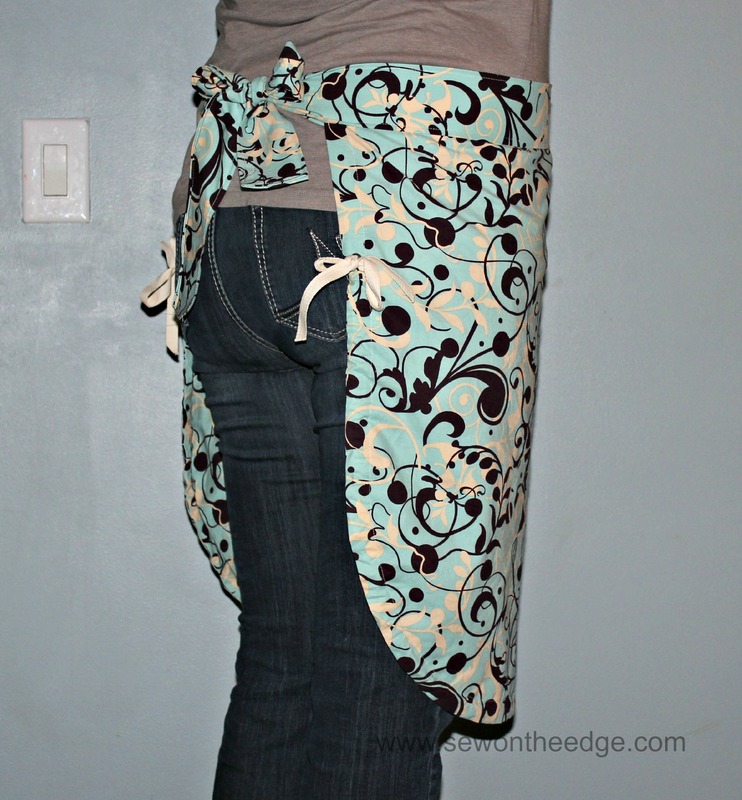 I know some people keep water proof bags in their kitchens to throw their dirty towels in, my laundry room is right off my kitchen so they just get thrown into what ever load of laundry I am currently doing. 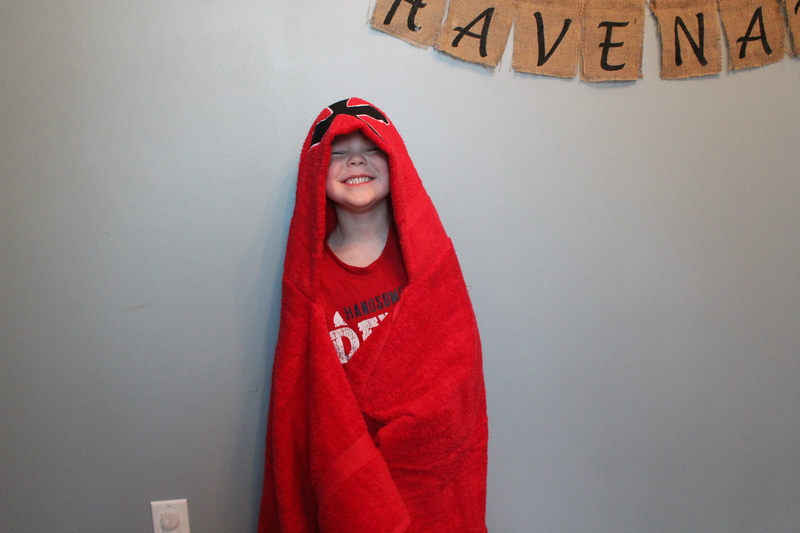 What kid does not love to get out of the bath and get wrapped up in a hoodie towel. 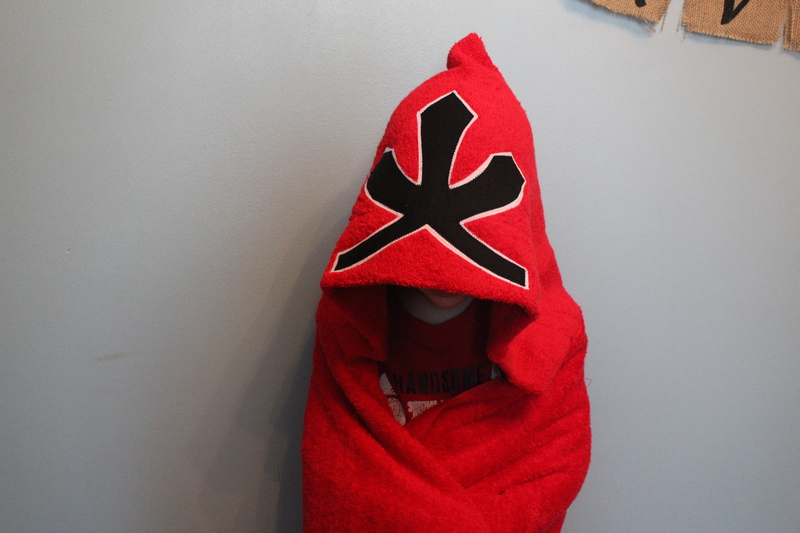 The problem is that at our house all the hoodie towels are made for toddlers. 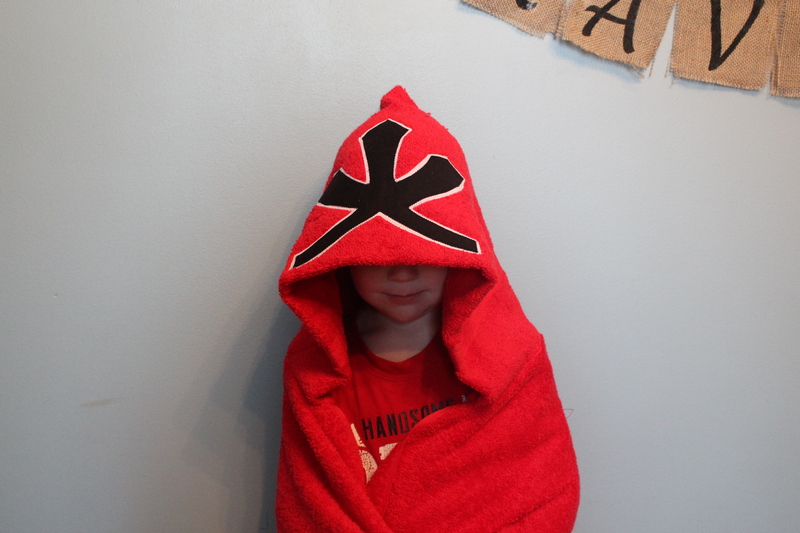 My boys are not ready to give them up, nothing is better than after drying off, pretending that they are their favorite action hero. 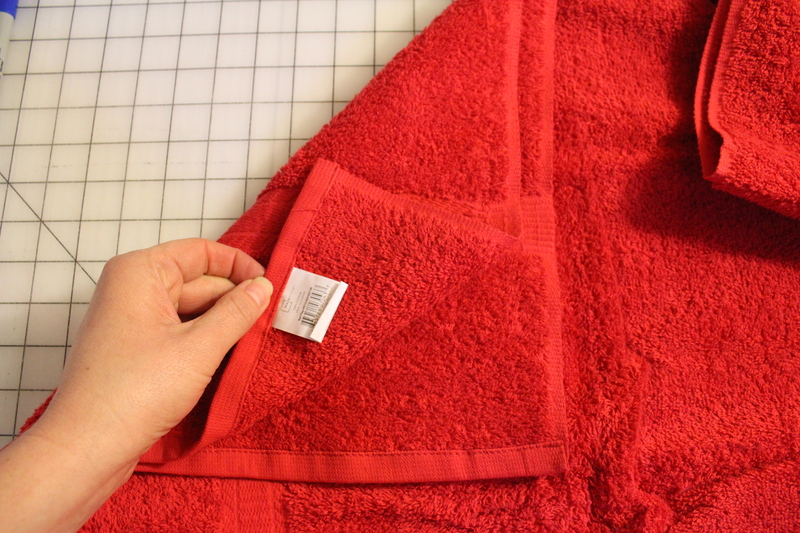 Below is a tutorial on how to make a hoodie towel that will fit those big kids too. 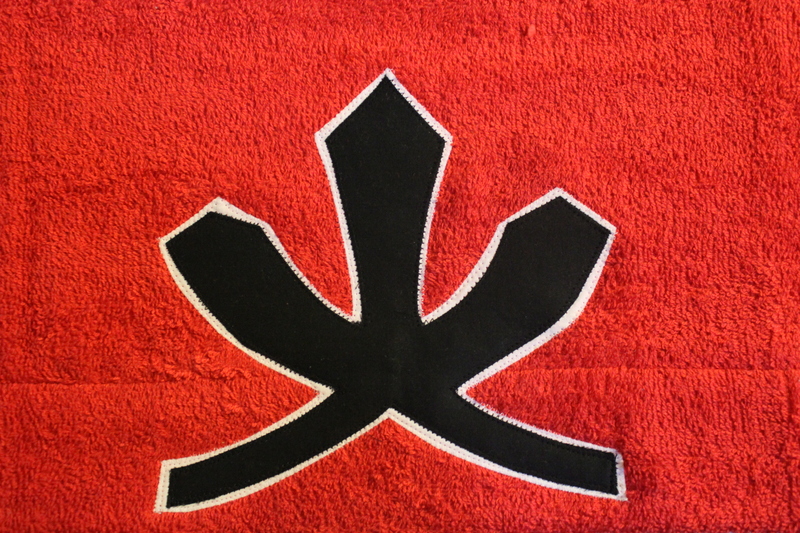 My boys are obsessed with Power Rangers right now so when I asked what kind of towel they would like of course it was the red Power Ranger. 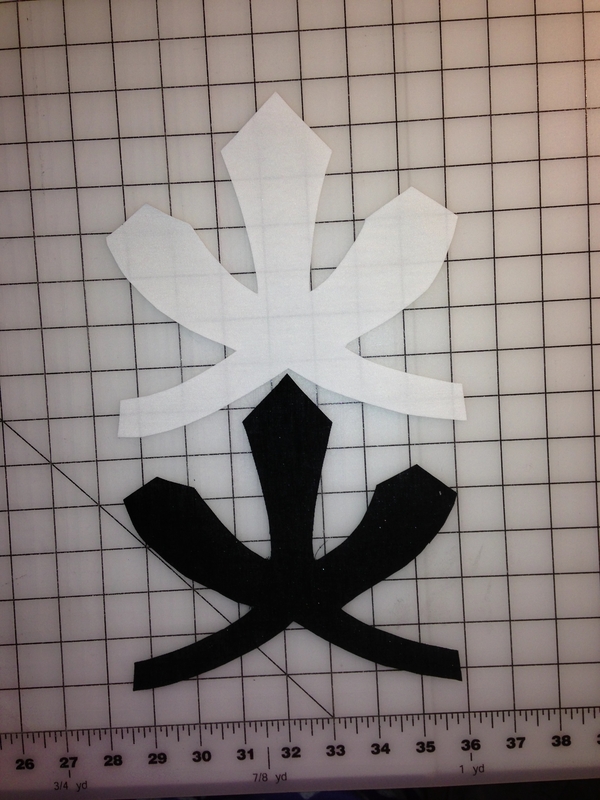 Step 3: Cut out the white and black fabric. 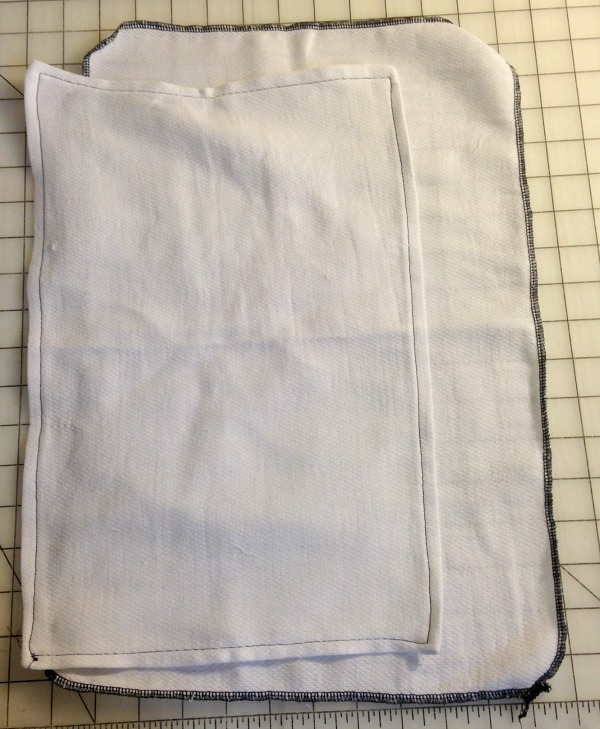 I cut the black fabric about 1/8 to 1/4 inch smaller than the white. 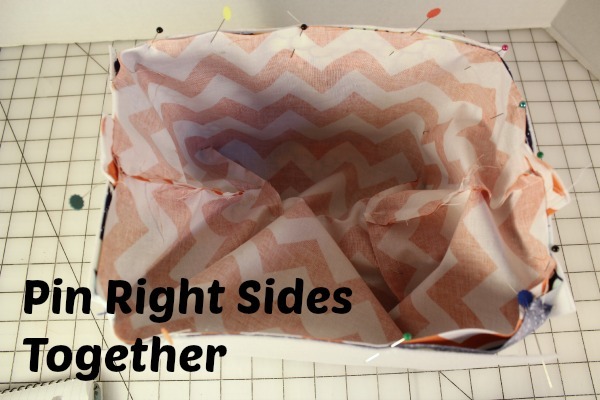 Usually I just eye it. 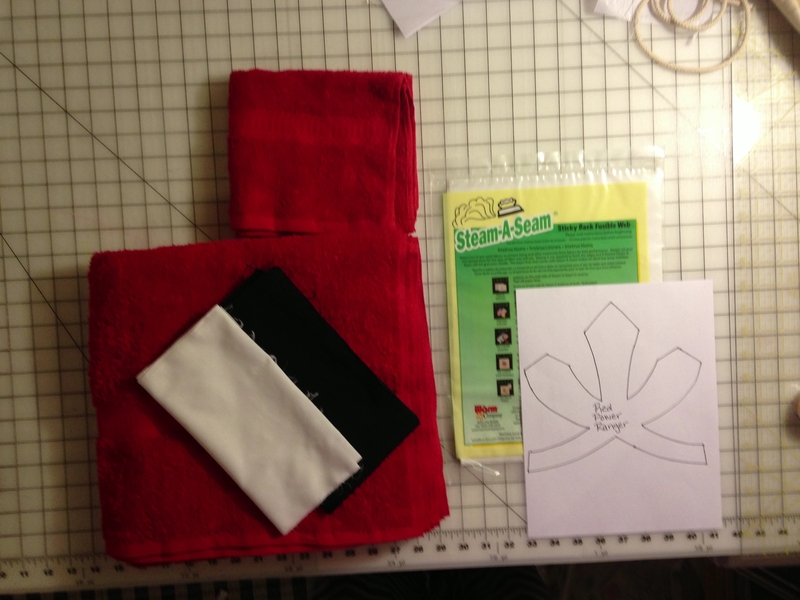 Step 4: Peel off Steam A Seam from the black fabric and align it on top of the white. 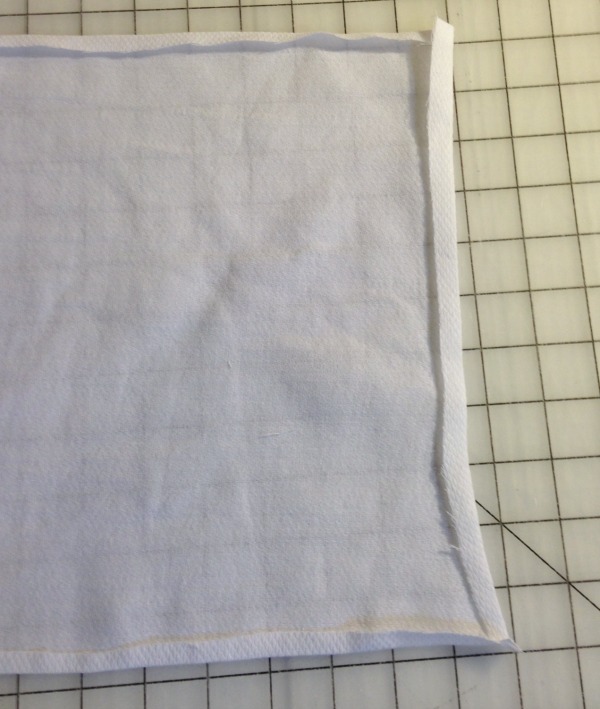 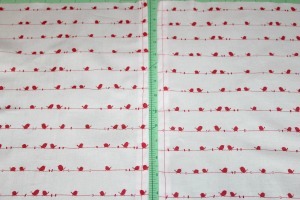 Step 5 : Take your hand towel and on either of the long sides fold down 3 or 4 inches. 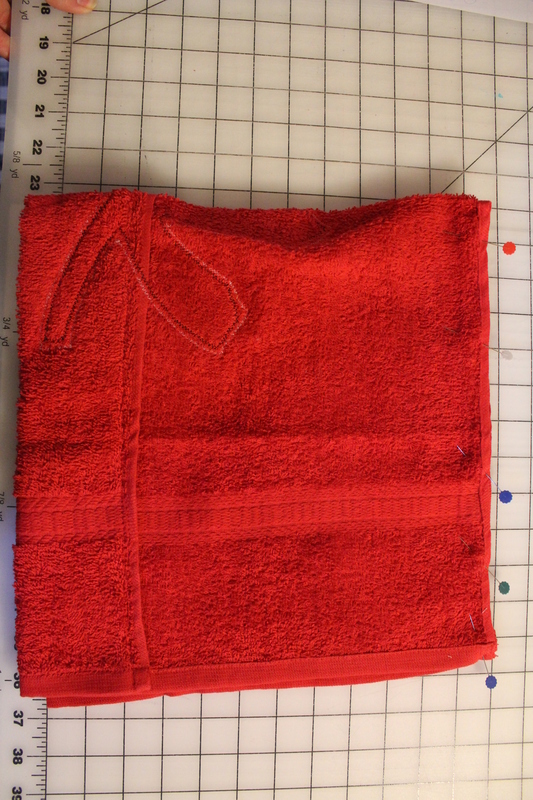 I used 3 inches for this hoodie towel. 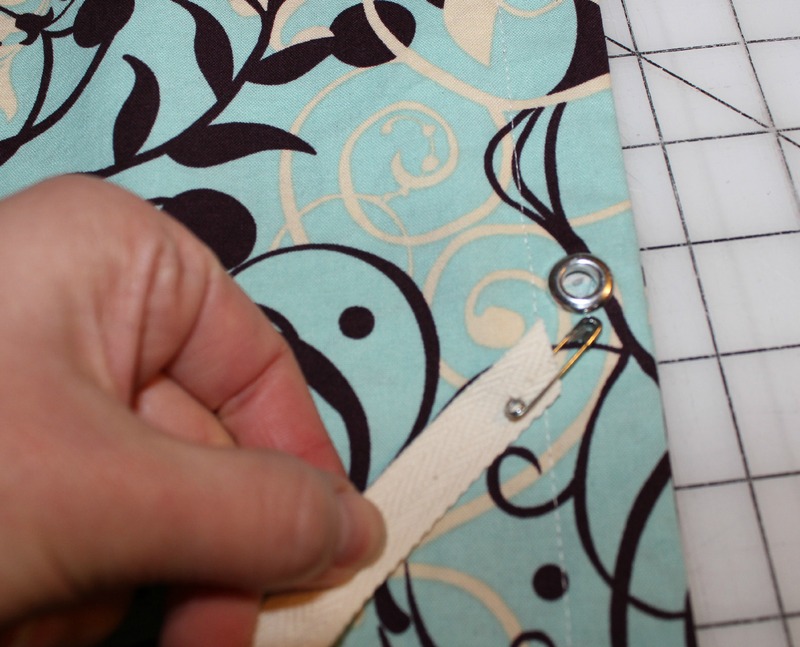 Pin across. 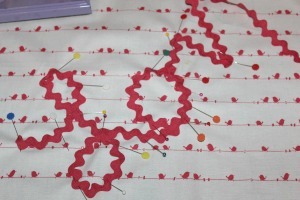 Step 6: Stitch across what you just pinned. 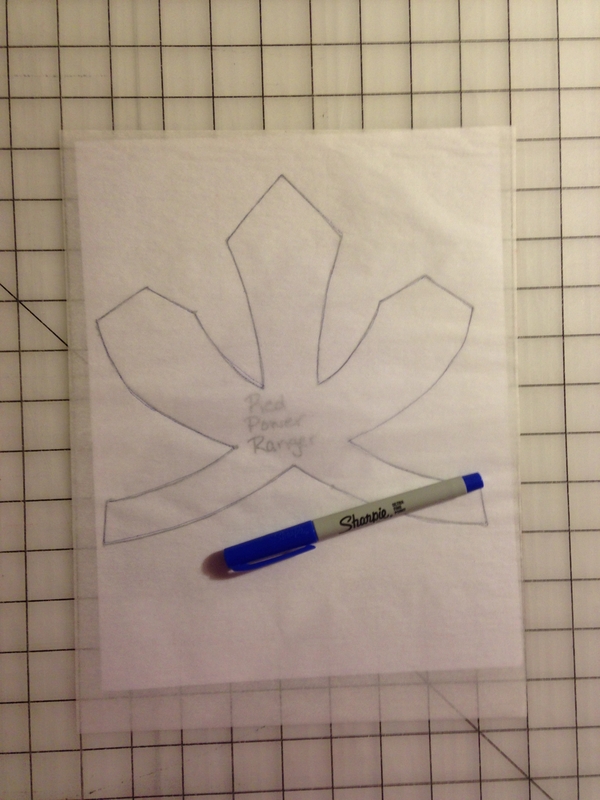 Step 7: Take Power Ranger emblem and peal off the back paper of the white fabric. 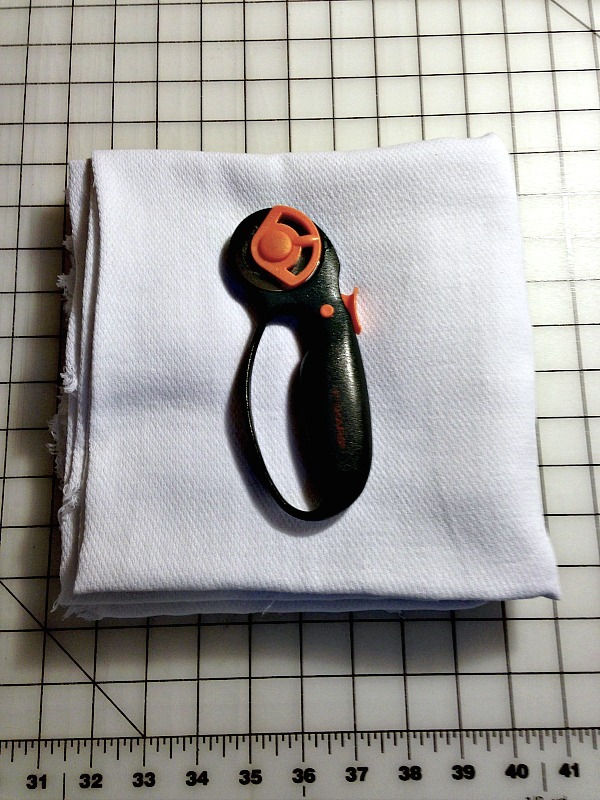 Center the emblem on the hand towel and once you have it where you want it iron it down. 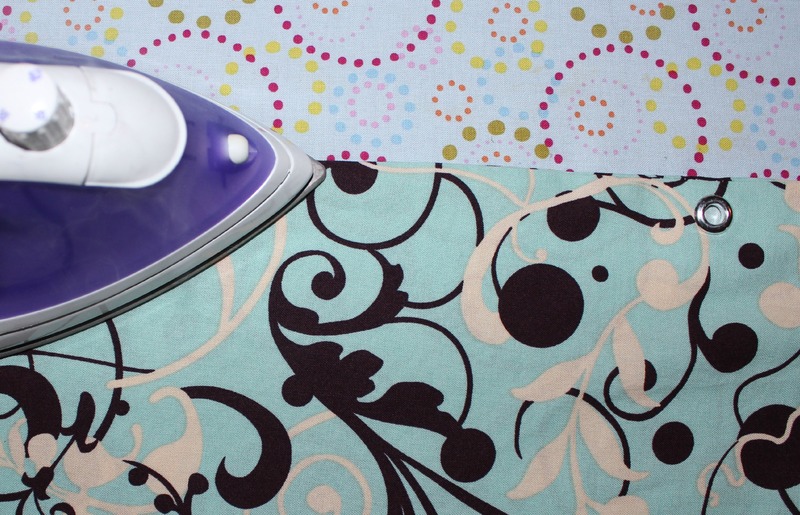 Once you iron it it is permanent. 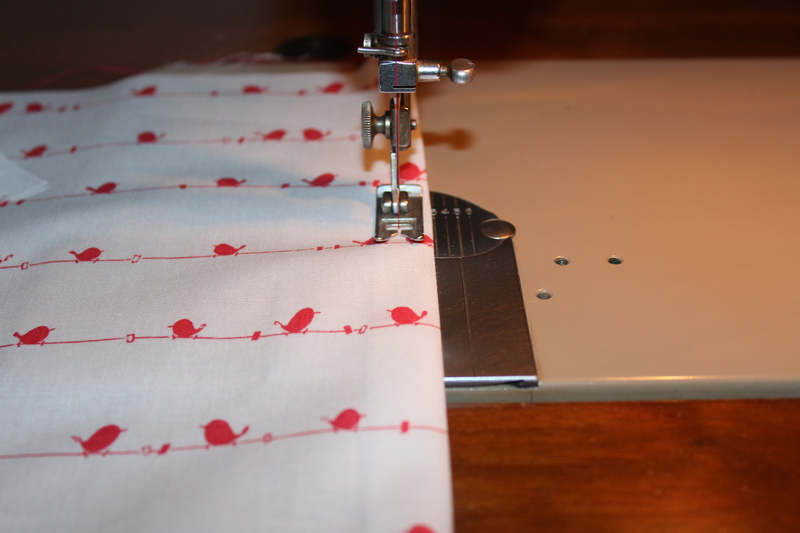 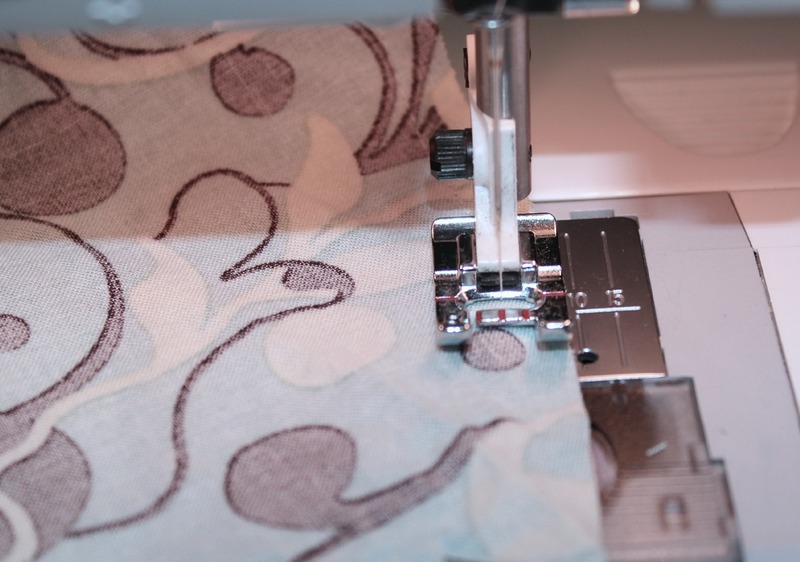 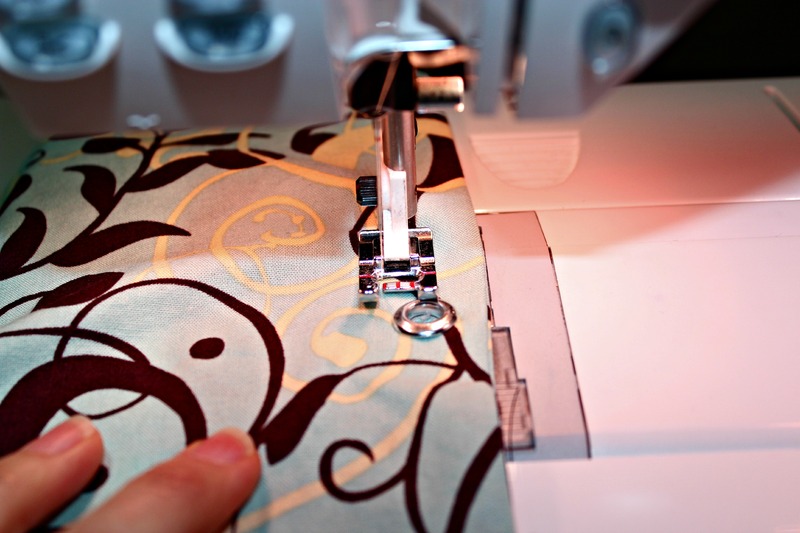 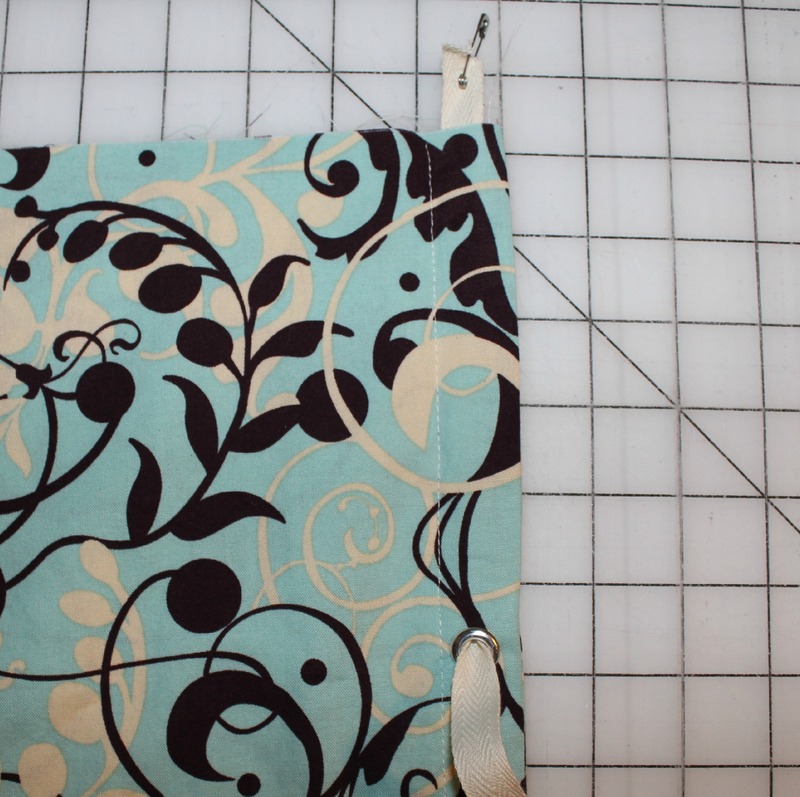 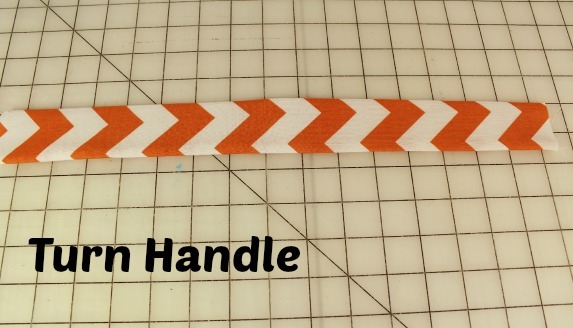 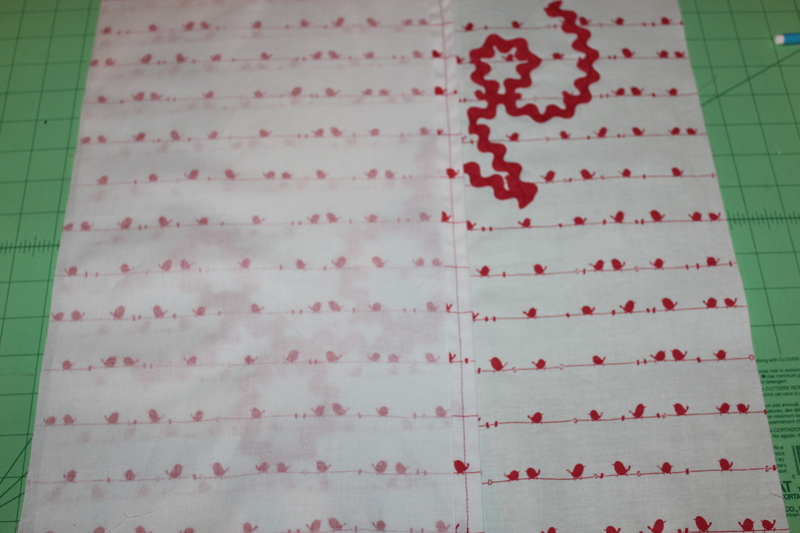 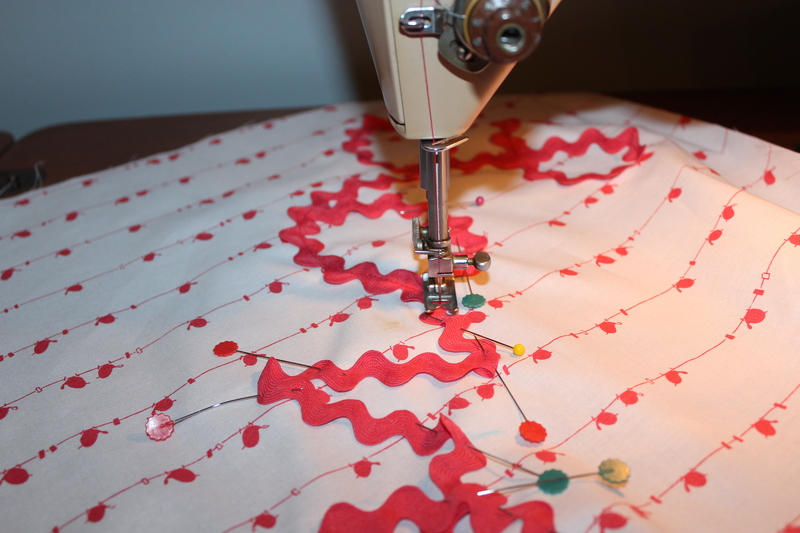 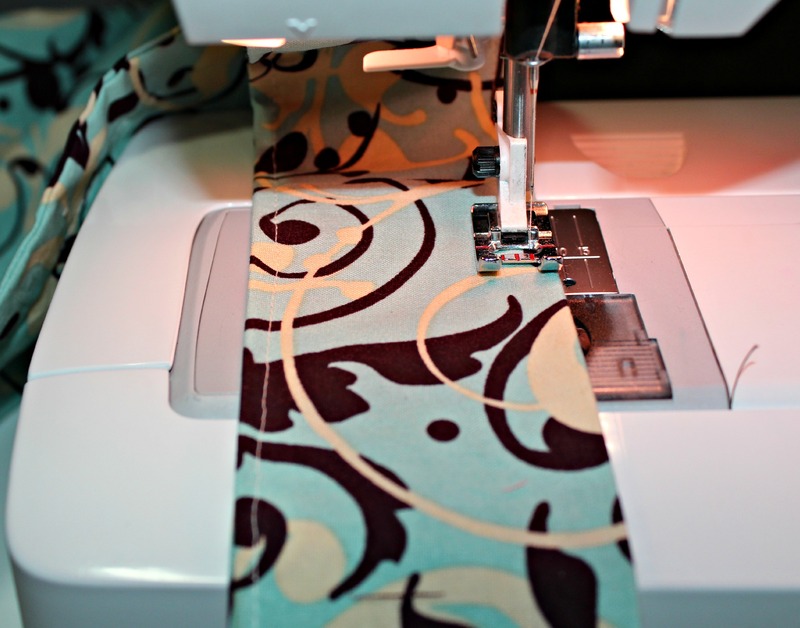 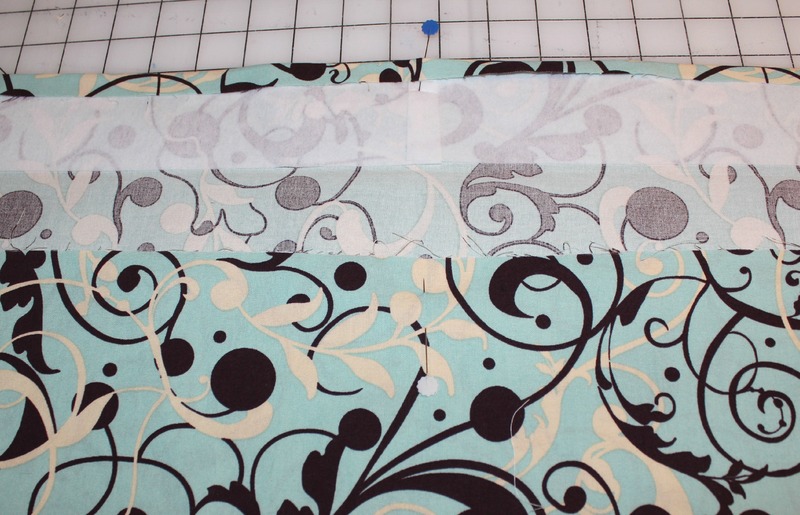 Step 8: Set your machine on zig – zag or satin stitch which ever is your preference. 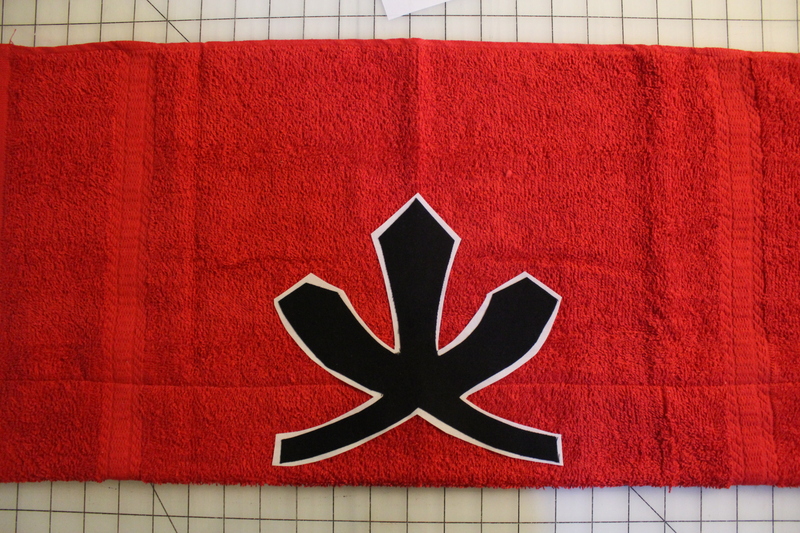 I used a zig-zag stitch on this towel. 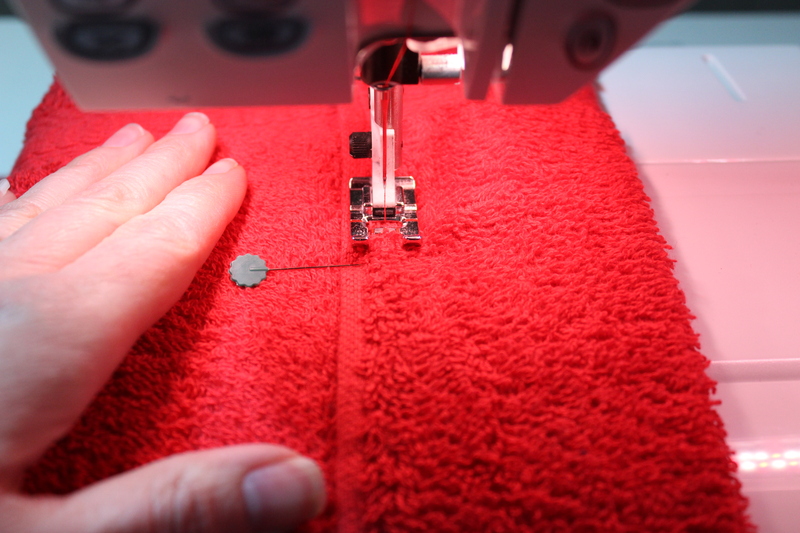 Change your thread to white and stitch around the white, then stitch around the black with black thread. 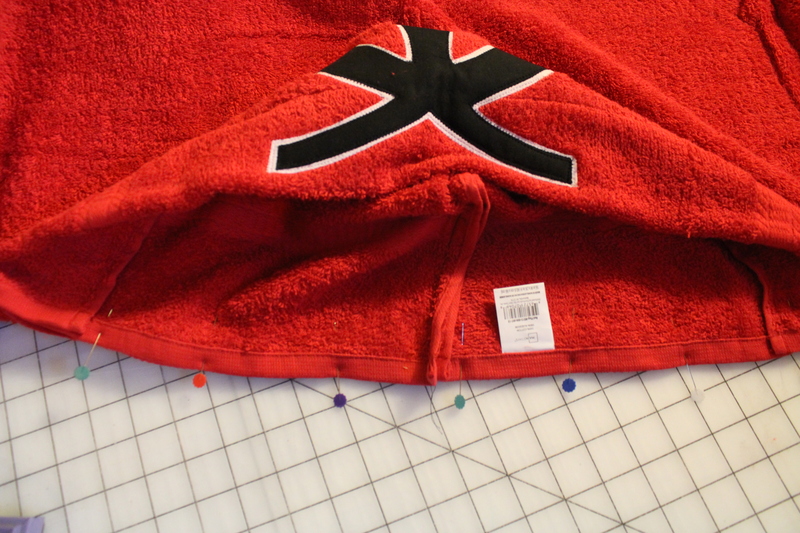 Step 9: With right sides together sew the back of the towel to make your hood. 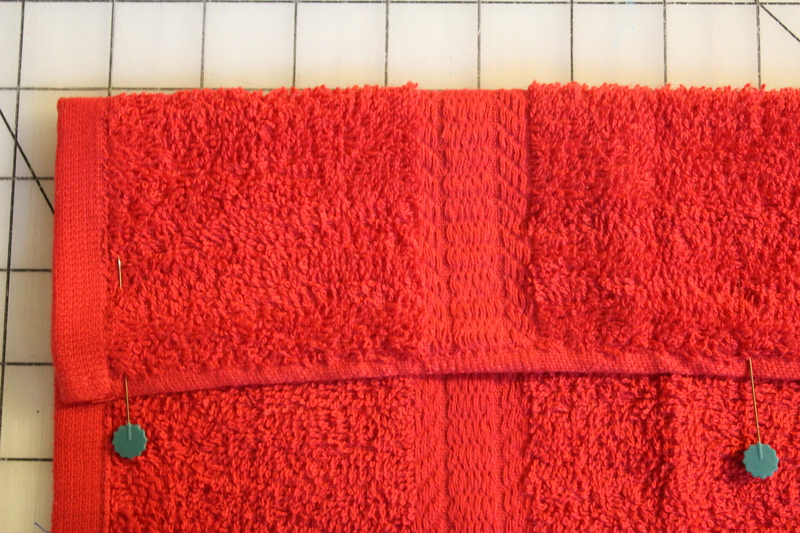 Make sure you change your thread color to match your towel again. 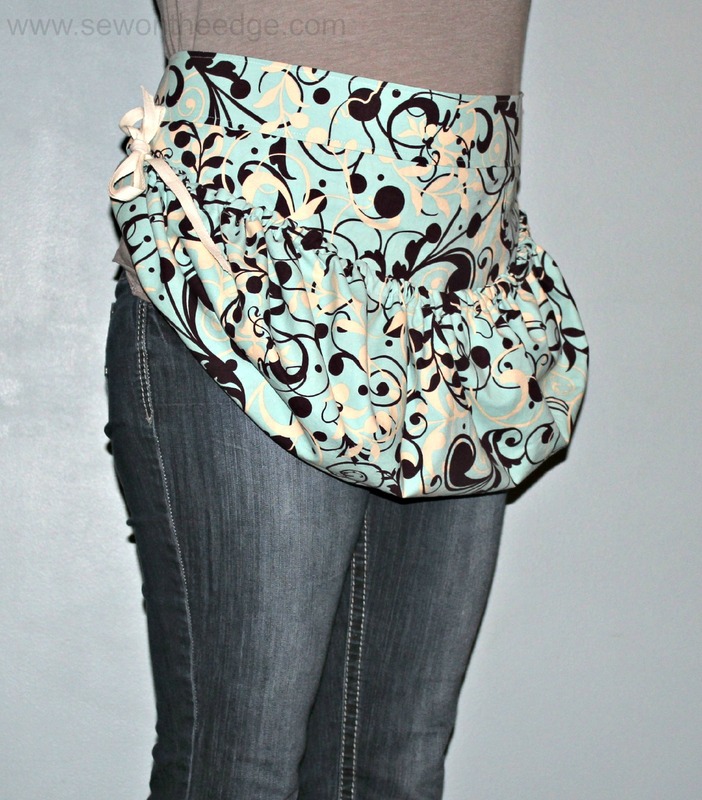 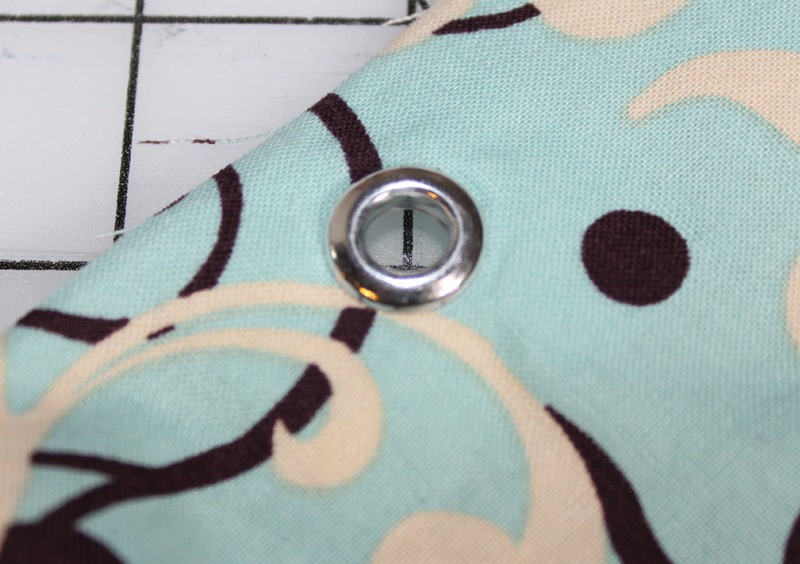 I forgot to change my threads but I am going to say I did that on purpose to show you where to sew. 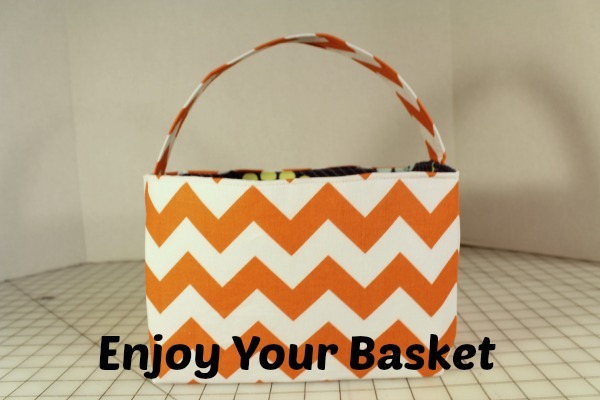 That’s my story. 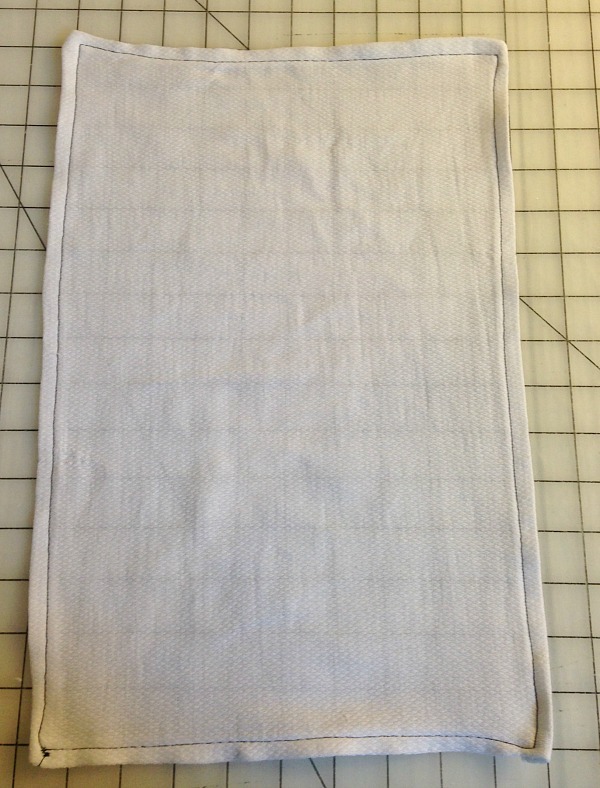 Step 10: Grab your large bath towel and find the middle on one of the long sides. 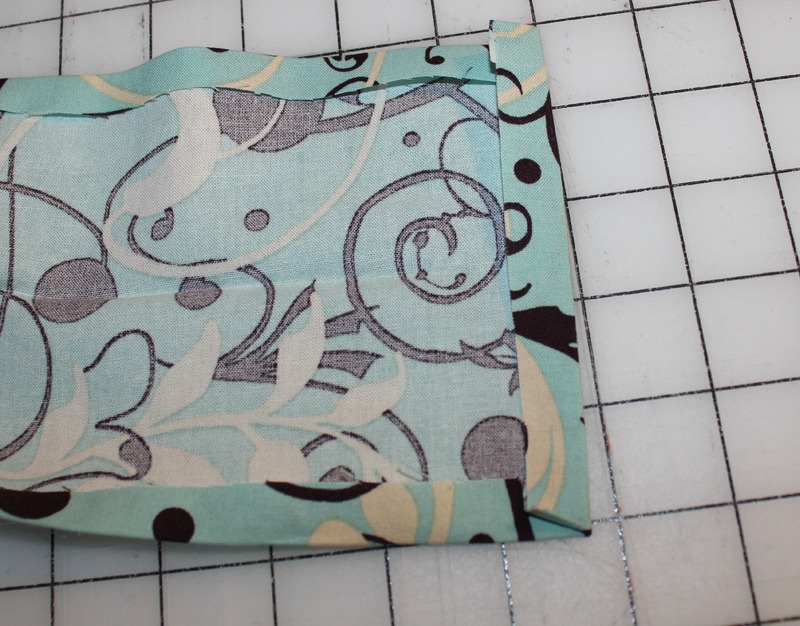 I also like to make sure that I have the side with the tag folded in . 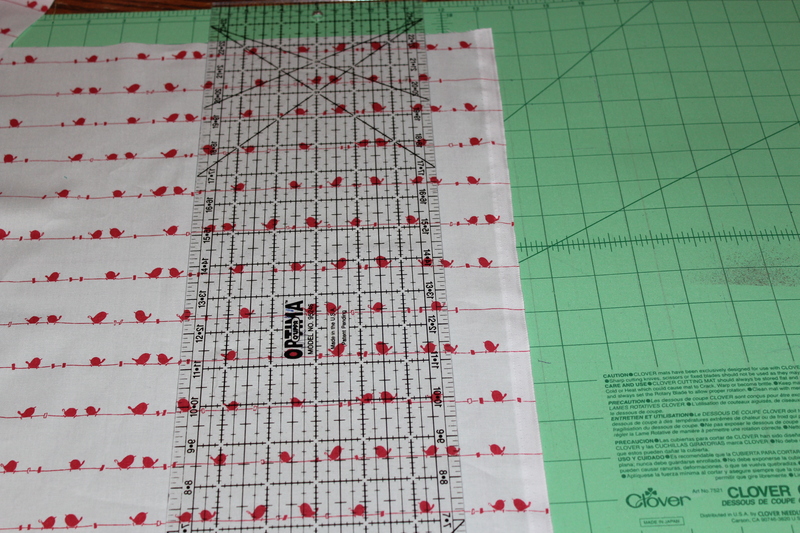 On the long side where you found the middle you are going to line your hoods middle up, with right sides together. 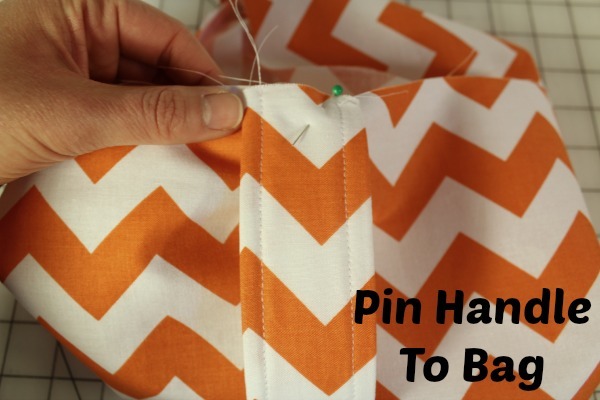 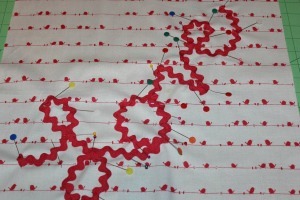 Pin down and you can either straight stitch or zig-zag. 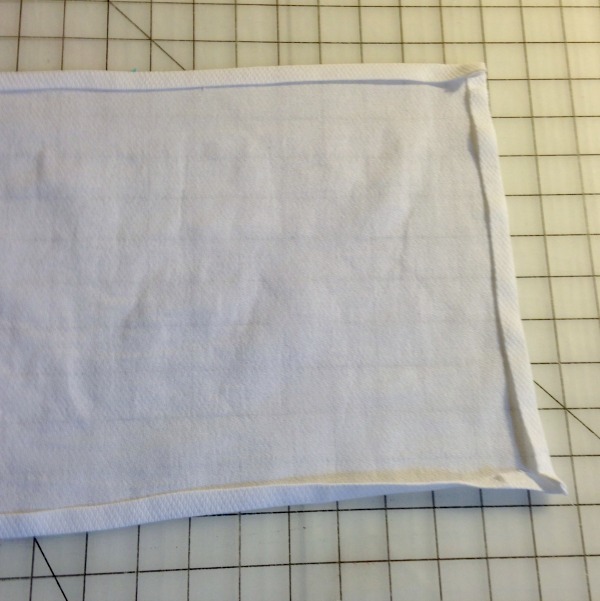 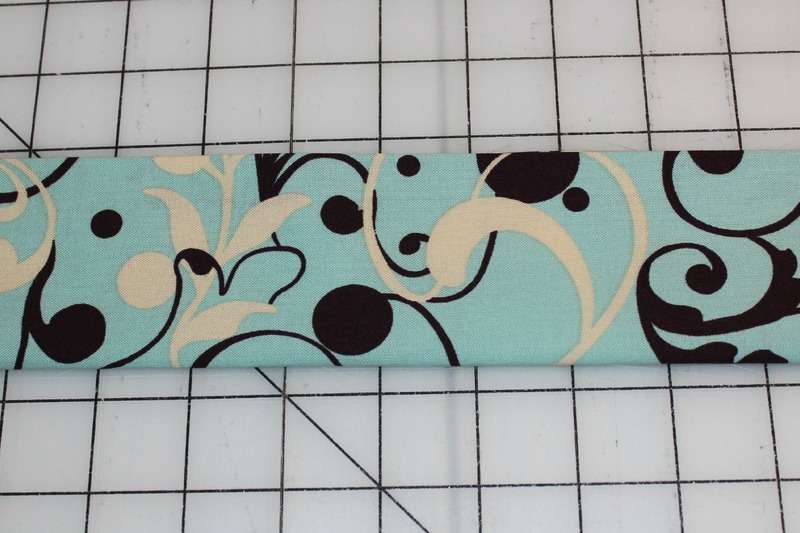 Also I sew to the left of the bulky towel edge, just makes it easier on you and your machine. 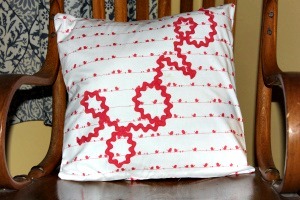 I used zig-zag to give it a little more strength because I knew the wear and tear my boys will be putting them through. 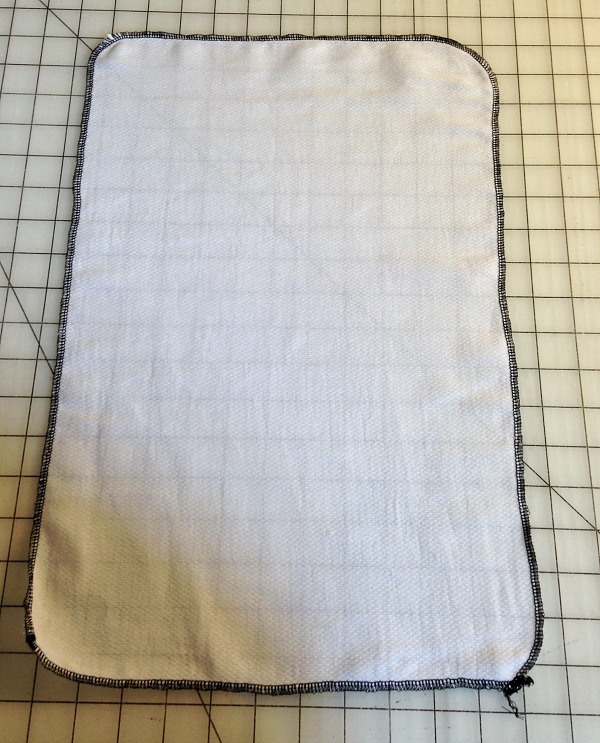 Step 11: Grab your kids and throw them in the tub so they can use their new towel.